This feature-length documentary follows six young black men through the trials and triumphs of their first three years of college. How do they navigate persistent racial provocations? Alumni of the unique Ohio mentoring program Alchemy, they are hell-bent on disproving society's stereotypes and low expectations. Amazingly, they grow before our eyes. 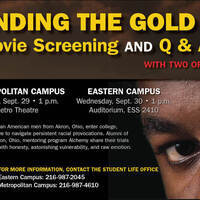 Q&A with two of the film’s stars will follow the screening.Tri-C President Alex Johnson celebrates the College's success and provides an updates on its top priorities. Light "high tea style" refreshments will be served. See you there!